The arguments in favour of open standards and open source are compelling. Philosophically, I find appeal in the principle that my work should be available to all those who would benefit. Even from a cynical, tax-payer’s perspective, I would rather that products whose creation has been paid for out of public funds should be freely available. But can we make it work in practice? The Prisoner’s dilemma – the canonical game theory scenario described by Flood & Dresher more than 60 years ago – demonstrates that whilst a group of individuals may achieve the optimal outcome from cooperation, the risk that some may not cooperate means that the optimal strategy for individuals may be to act selfishly. A similar problem arises in the creation and adoption of open-standards and open-source software. There is clearly a benefit to openness in the medium to long term as it will be easier to create interoperable ICT systems to meet new health needs. Once open systems are created and tested they can be game changers – consider the examples of TCP/IP and HTML, the building blocks of the Internet. However, in the short term, there is a cost to openness – it’s almost always easier for someone to hack together an ad-hoc interface for a specific purpose than it is to select and implement a standard. There’s the rub – whilst we know that cooperation may greatly benefit us in the longer term, we compete as individual organisations who, out of necessity, choose selfish strategies to meet short term goals. Are there any strategies we can use that may shift the balance in favour of cooperation? Investment in the creation of open standards (for example, by funding standards development) will result in the creation of new standards. What can’t be guaranteed is that the standard will ever be useful or even used. For example, in England a standard exists to send structured messages to GP practices, but how many suppliers support more than a subset of the potential messages? The temptation is therefore for investment to be backed by a mandate that the standard be adopted. The drawback is that rigid enforcement of a standard will inevitably stifle innovation – we don’t want a Lada health system – so we need standards to be chosen because they are making it easier to deliver solutions. 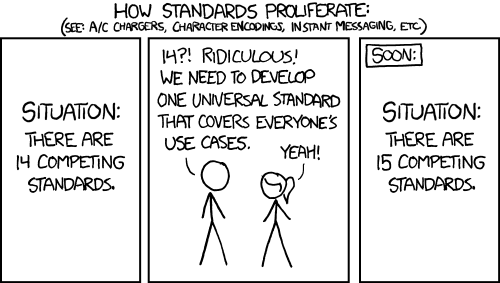 Conversely, we know that a large number of standards already exist but few achieve significant levels of adoption (i.e. beyond the creator!). These standards aren’t adopted because they fail to deliver the short-term benefit. Indeed, it can be easier to create a new ‘standard’ than to adopt an existing one. The barrier that standards need to overcome is to provide immediate, short-term utility to individuals. But utility only arises after widespread adoption – as in the prisoner’s dilemma we lose (as individuals) if we commit to standards and others in the marketplace don’t. For example, there was a requirement for UK GP systems to allow extraction of patient records so that they could be loaded into new systems when the patient changed GP. From the system supplier’s perspective this functionality was a charter to their competitors to take their business – whoever implemented the feature first faced a massive competitive disadvantage. It wasn’t a surprise that the implementations weren’t fit for purpose outside of the accreditation process! We therefore need to identify areas that provide short-term utility and encourage development of trust and cooperation. I think it is safe to assume that there will never be a single computer system representing the entirety of health and social care. Therefore there will be 2 or more computer systems that coexist to support the health domain. We know that without interoperability between systems we create information silos that hide crucial information and hinder care. So the ICT enabling health and social care in the future will consist of multiple, communicating information systems. The difference between where we are now and where we seek to go is communication. In 2006, messaging was identified by the British Computer Society as as key priority. There are mechanism in place to support messaging in the NHS – e.g. Transaction Messaging Service. However, the complexity of engaging with these projects is massive, which is why phone calls, letters, faxes, emails and other mechanisms that deliver immediate utility provide the de facto messaging for much of the NHS. If messaging were more accessible, health apps and services would be able to communicate. Through communication the patterns of frequent interaction would become formalised as a standard, with self-interest driving creation of open standards and means to handle particular modes of communication. Conversely, without communication there is no benefit to standardisation and we remain locked in the dilemma facing Flood & Dresher’s prisoners.